Jan. 16, 2018 - Like a wisp of smoke, a waft of alcohol, or a tiny pill, it’s difficult to measure the exact size of the problem of substance abuse in the workplace, but a group of sawmill industry experts has placed the issue firmly at the top of their safety agenda. 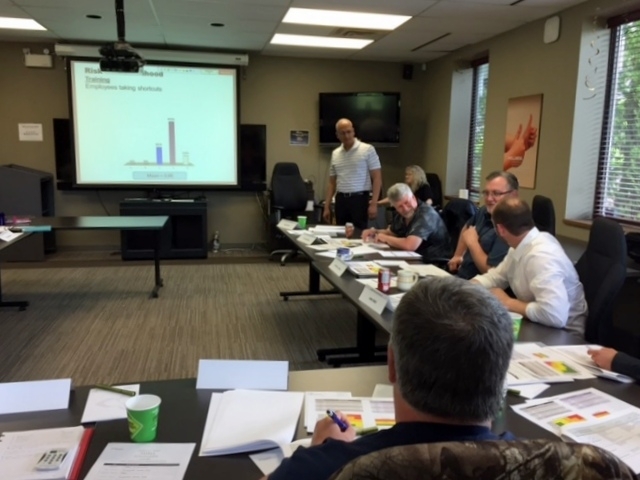 Last June 2017, a volunteer group of subject matter experts met face-to-face for a sawmill workplace risk assessment at Workplace Safety North (WSN) headquarters in North Bay, Ontario. The group of 15 representatives from management, labour, government, and not-for-profit organizations, was facilitated by Sujoy Dey, Ph.D., Corporate Risk Officer at the Ministry of Labour (MOL). In advance of the workshop, each industry expert submitted their top health and safety concerns, and during the one-day workshop, all 80 identified risks were reviewed and discussed by the group. When it came time for the final vote on the top risks, only actual workers and managers in the sawmill industry were allowed to vote. In order to ensure an open and fair voting process, handheld electronic devices recorded votes anonymously. Both labour and management agreed: the top danger sawmill workers face is substance abuse. “As they identified specific conditions and situations that could result in injury or illness, we asked the group, ‘What keeps you up at night?’” says Dr. Dey, “And both workers and managers agreed: the number one risk in sawmills is substance abuse.” Dey notes the category includes not just alcohol and recreational drugs, but also prescription drugs, such as pain medication. Being under the influence of alcohol or drugs – prescription or not – is a longstanding safety concern in the workplace, and it’s a difficult thing to measure (unlike, for example, Workplace Safety and Insurance Board statistics on slips, trips, and falls in the workplace). Even though there are issues regarding social stigma, privacy, and human rights concerns, drug and alcohol use in the workplace is an issue that’s too risky to ignore any longer. “An interesting outcome of the workshop was that the number one risk was not on Workplace Safety North’s radar as a priority concern,” says Tom Welton, WSN Industrial Director. “WSN historically uses WSIB [Workplace Safety and Insurance Board] statistics to provide a clear picture of workplace injuries and trends. “The risk assessment workshop provided direct feedback from industry experts about their perception of the workplace. By using leading rather than lagging indicators, WSN can be more proactive,” says Welton. Three of the top 10 risks involve psychosocial or mental health issues: substance use, lack of focus, and stress. As more workplaces gain a better understanding about the importance of taking a holistic approach to health and safety and having a supportive workplace culture that encourages both self-care and concern for co-workers, research also supports an increased focus on overall well-being. The results of the workshop were reviewed by the Ontario volunteer industry advisory committee for Forestry, Paper, Printing, and Converting sectors. The committee, in conjunction with WSN, is supportive of the next step: a detailed analysis of the root causes of substance abuse in the workplace, and the creation of an effective prevention plan. For more information, contact info@workplacesafetynorth.ca. This article was originally published by Workplace Safety North.